I'm thinking back to when the irises where blooming. That seems like such a long time ago now that the pumpkins are harvested, doesn't it? 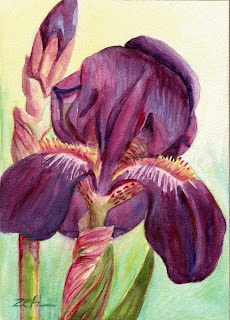 An iris is a lovely flower to look at and a lovely thing to paint as well. Here, I've focused on just one bloom with a bud about to burst open in order to portray the delicacy and the velvety look of the petals.If you have irises in your garden, the leaves can be cut back in the fall to a 12 inch fan. If they have grown into a thick clump, you can dig them up, divide the rhizomes and replant them with more space between for better blooms next year.